The central region of Chile is appreciated by tourists for its beautiful wine valleys with their high quality wines. Many come for a day trip from Santiago or spend several days on a wine tour in one of the many wineries and boutique hotels. At the same time, the central region, just south of the famous Colchagua Valley, hides several natural jewels waiting for explorers with wanderlust. These natural reserves are relatively little known and therefore not crowded at all. In the area between Curico and Talca, only about 270 km southeast of Santiago, you will find several natural reserves, which not only let their visitors forget all the stress, but also leave you breathless for sheer natural beauty. Perhaps the most beautiful of those parks is the “Radal Siete Tazas”, which was declared national park in 2008. The name “seven cups”comes from one of the main attractions of the park, seven rock pools (“cups”) formed by the Rio Claro over time into its bed of basalt rock. The turquoise waters of this river descend from one basin into a lower one and so on, creating a wonderful postcard motif surrounded by lush green pristine forest. Nearby there are several other spectacular waterfalls falling into small lagoons. As if that were not enough, there are hiking trails for every taste. Some go uphill, offering breathtaking views across the treetops to the nearby volcano “Descabezado Grande” (the “Big Headless”), which bears this name because, at a great eruption in ancient times, the summit was blown away leaving a huge crater. Other trails lead down to the Rio Claro where you can linger on small river beaches. The river has not only dug the Siete Tazas into the rock, but created many small rock pools in which the crystal clear, fresh water is calm and perfect for a bath. If that’s too cold for you, you can enjoy your picnic on the white sand and marvel at the beautiful color combination of blue / turquoise (water and depending on the weather also the sky), deep green forest, light gray rock and yellow-white sand, while just forgetting the rest of the world. In winter, the park is a great place for horse riding and snowshoeing. In addition, the area is known for the clear night sky that invites you to stargazing – it is said that this area is often visited by UFOs – who knows? The park can be visited by rental car throughout the year. There are plenty of campgrounds open in summer, but there are also cottages and small guesthouses open all year round. It is also very suitable for going by camper. You reach it from Santiago via Ruta 5 Sur via Curico to the village of Molina and from there continue to the east. 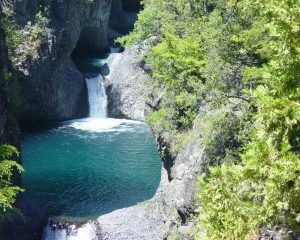 We will be happy to help you to arrange a rental car tour through Central Chile to see exciting destinations like this one. Contact us and we’ll help you plan your personal rental car adventure in Chile with the perfect car type for your plans.